I do not know exactly what this antenna is for. 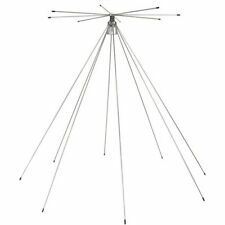 Antenna is made for outdoor use as a base scanner antenna. ((((( The HG Base Scanner Antenna outperforms a la rge selection of scanner antennas in the market ))))). The HG – Base Scanner Antenn a. The antenna also covers the Aircraft Band 108 to 137 MHz & the CB band! 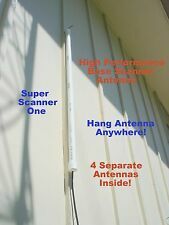 Scanner 25MHz-1,300MHz VHF/UHF Super Discone Base Antenna. Manufacturer: TRAM(R). Manufacturer TRAM(R). Model Number: 1410. Manufacturer Part Number 1410. Product Model 1410. Item#: 5892284. Our apologies for any inconvenience. Antenna connection: SO239. Don't forget. ANT32 covers all frequency bands 25 - 1200 MHz. Bearcat I Electra. Bearcat II Electra. Bearcat III, BCIII, BC3; BCA, BC3-L, BC3-H, BC3-U, BC3-L/H, BC3-L/U, BC3-H/U Electra. Bearcat IV, BCIV, BC4 Electra. Condition: Used. NO antenna included, you will need the antenna for it to work. DO NOT INCLUDE ANTENNA. Northwest Territories (NT): 5%. We test all our products and descript them to the best of our knowledge. Both are 75 ohm coax and all scanners have a 50 Ohm input impedance! Using RG-59 coax creatures built in signal loss from mismatched coax. It has a standard BNC connector on the coax to plug directly into most scanners.Check your radio's manual if you don't know which coax plug fits your radio. Manufacturer Tram. Model # 1410. Rust Free Stainless Steel Construction. Transmit Bands are 144, 220, 440, 900 and 1200 MHz. Frequency 25-1300 MHz. (With 50ft. of coax cable. Antenna connection: SO239. ) 2018-07-02. ) 2018-07-03. ) 2019-01-08. d 7 ( 192. ) 2019-03-01. Ideband Stainless Steel Discone Base Station Antenna. 25-1300Mhz receive. Transmits 27/28Mhz, 144-160Mhz, 430-470Mhz, 220-225Mhz & 902-928Mhz. For Transceivers and Radio Scanners. Requires Optional mast pipe, and optional coax lead-in cable. DO NOT INCLUDE ANTENNA. Condition: Used. You will need the antenna for it to work. Northwest Territories (NT): 5%. We test all our products and descript them to the best of our knowledge. I usually response within 12 hours as I'm a workaholic. BNC plug fit radio scanner with BNC connector. Features & Specs Connector: BNC Male. Full band scanner antenna mini magnet mount. Enhanced magnet unit, stronger than others! fine tuned for wide-band receiving. Scanner users should understand that the VHF/UHF radio signals transmitted by police, fire, govt., public service agencies, and ham repeaters are mostly line of sight signals. Scanner listeners in mountainous areas may have serious problems this factor. Both are 75 ohm coax and all scanners have a 50 Ohm input impedance! Using RG-59 or RG-6 coax creates built in signal loss from mismatched coax. It has a standard BNC connector on the coax to plug directly into most handheld/base scanners.Check your radio's manual if you are not sure what kind of coax plug your radio needs. UNIDEN - RADIO SHACK - GRECOM - GRE - UNIDEN. It out performs any antenna we have ever seen. Perfect for the single antenna APX8500 & Harris Unity Radios. 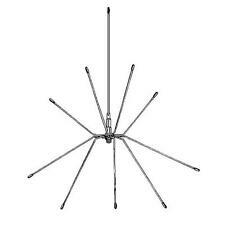 Check out item # 172620000136 for a BNC Magnet Base base for this antenna. VTG BEARCAT MODEL BC 8 BASE RADIO SCANNER RECEIVER + ANTENNA . VTG BEARCAT MODEL BC 8 BASE RADIO SCANNER RECEIVER ANTENNA .. This is as is. Tuned on when plugged in. Scanner sounds good. Just dont know enough about this. So thats why its as is. So please be able to repair it before purchasing. Just incase it doesn't work properly. Photos describes condition. Cable Connector BNC Male Plug Connector. 1 x Antenna. 1 x Magnetic Mount Base. Date Range Probability Date Range Probability Date Range Probability. Noise ≤2dB. Fits select models of scanners such as Radio Shack Realistic PRO-2016, PRO-2028, PRO-2030, PRO-2333, PRO-2034, PRO-2040, PRO-2044, PRO-2048, PRO-2050, PRO-2052, and others. Picture of TA-STM-1 in PRO-2034 scanner for illustration purposes only, scanner not included. FITS GRE BEARCAT UNIDEN COBRA RADIO SHACK & OTHERS. Fits any Scanner with MOTOROLA PUSH IN CONNECTOR. Note: This Antenna Is A Right Angle MOTOROLA Type -. Get Maximum Range From Your Scanner! Look At The Connectors First Before Ordering Motorola Or BNC! Manufacturer mfj. Model # 1866. Rust Free Stainless Steel Construction. Transmit Bands are 144, 220, 440, 900 and 1200 MHz. Frequency 25-1300 MHz. WHY BUY FROM US?. WE HAVE BEEN IN THE ANTENNA AND RECEPTION BUSINES SINCE 1981! Modifications void your warranty (especially radio MARS/CAP modifications). (4) SCANNER BASES. All proceeds go to charity: The Blind Center of Nevada! BASES TESTED FOR POWER AND THEY POWER ON. FEMALE BASE. REALISTICTHAT USE A TOP FEMALE SCREW IN TYPE ANTENNA. THIS IS A FEMALE THREAD TYPE ANTENNA. FEMALE THREAD.